I'm starting to wonder how Ginsberg has any time to do the things she writes about - I realized halfway through this book that I'd read another book by her, titled Raising Blaze: A Mother and Son's Long, Strange Journey into Autism. In that book, she talks about how she reorganized her life around raising her son, who has autism but is more on the savant end of the scale. Anyway, this book provides an inside look into the world of waitressing. It's got its funny moments, but generally is more about her experiences in particular than about waitressing in general. 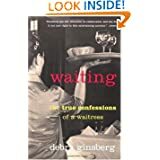 I guess I was disappointed by that, hoping for more of an anthropological look at the culture of waitresses, but it would also have helped if I'd realized I'd read something by this woman before. I'm not sure I'd recommend it - I'm sure there are blogs on the subject that are just as interesting, and much briefer reads.